We invite you to explore India - the Land with infinite beauty ! Whether you soar high into Himalayas or peer under the ruins of the Ancient monuments dotting the landscape of India, you will cherish the experience long after your visit ! 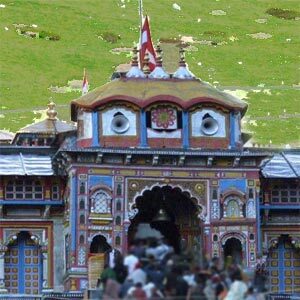 This India Travel Guide on Badrinath is free from any commercial interest! This site is dedicated to promote India - the vast subcontinent, its glorious past, magnificent landscape and its infinite variety. Considered the most important of the Char Dham, Badrinath is the holy seat of Lord Vishnu. This temple is colourful and reflective of the Buddhist architecture in the area. The temple at Badrinath is revered as Lord Vishnu is believed to be the supreme god of those of the Vaihnavite persuasion of Hinduism. The shrine at Badrinath was established by Adi Shankaracharya and is one of the 108 Divya Desams - holy shrines for the Vaishavites. Other 4 shrines that constitute the Panch Badri along with Badrinath are Bhavishya Badri, Yogdhyan Badri, Bridha Badri and Adi Badri. This temple is also known as Badrinarayan Temple and is one of the Char Dhams that is devoted to Lord Vishnu. Located along the Alaknanda River, the Badrinath Temple has a cuppola within a gold gilt roof. Climb up the wide flight of stairs leading to the main shrine. The main shrine is a black Saligram stone that is considered to be of the self-manifested statues of Vishnu. It depicts Lord Badrinarayan sitting under a gold canopy beneath a Badri tree. This is different from the usual reclining stance of Lord Vishnu as depicted. You will find many other shrines around - Nara Narayana, Garuda, Navadurga, Ganesha, Uddhava, Lakshmi and Kubera. Badrinath got its name from the abundance of ber (jujube) trees found in the area. It is said that Goddess Lakshmi took the form of berries to be able to protect Lord Vishnu during his penance in this harsh environs. The present-day temple was constructed by the Garhwal Kings and consists of - The Garbha Griha, Darshan Mandap and Shobha Mandap. The temple was renovated many a time, by various royal houses of Scindia and Holkar. At the temple entrance, you will find intricately carved assembly hall. At Tapt Kund, there are hot sulphur springs (at around 45 degrees C) with medicinal properties. Devotees participating in the special pujas take a holy dip in the Tapta Kund. It is located between the Nar and Narayana mountain ranges in Uttarakhand. Pilgrims bound for Badrinath can take the NH 58 from Rishikesh. Enroute, you can also visit the temples at Devaprayag, Rudraprayag, Chamoli and Joshimath. About 40 kms away is the Hemkund Sahib, holy to the Hindus and Sikhs. The temple at Badrinath Temple opens on Basant Panchami in April-May and remains open till Vijaydashami. Krishna Janmashtami and Badri-Kedar Utsav are celebrated with fervor here.